Sweepstakes: Enter to Win A Year of FREE Groceries & More from New World Pasta! Go here to fill out the form for your chance to win the It Pays To Eat Pasta Sweepstakes! 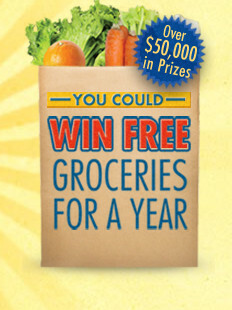 You could win FREE Groceries for a year! If you aren't the grand prize winner, don't worry because 450 lucky winners will get a $100 mini grocery shopping spree! Sounds good to me! Saveology is offering a $10 CVS Gift Card for only $6! This is a great way to save 40% on things that you need at CVS! This offer is exclusive to first time Saveology buyers only! The Fine Details: Valid for first-time Saveology buyers only. Limit 1 per person, per household, per credit card. Deal is good for 1 genuine CVS® Gift Card that will be mailed to your address once redeemed. Offer cannot be redeemed until the next business day after purchase at 10 AM EST. Although this gift card NEVER expires, this voucher must be redeemed within 60 days from date of purchase. Gift Card will be shipped via standard shipping to address provided on redemption site. No worries, there are no shipping charges to you and no hidden fees of any kind. Step-by-step redemption instructions will be on your voucher. This CVS Card may only be used for purchases at participating CVS locations. Protect this gift card as you would cash! This card may be used just like cash toward purchases at any CVS/pharmacy®. Cannot be used to purchase money orders or prepaid cards. Not redeemable for cash or credit except where required by law. CVS/pharmacy® cannot replace or replenish the card if it is lost, stolen or used without your authorization. This card is issued by CardFact, Ltd. Call Customer Service toll-free at 1-877-295-7777 should you have any problems concerning your gift card. To check the balance of this card, visit www.cvs.com. This gift card has no expiration date, and no dormancy or inactivity fees will be charged. Gift card retains unused balance and is rechargeable. Restrictions apply: *CVS/pharmacy gift cards cannot be used online at CVS.com, or for any other retailer’s gift card or prepaid card that CVS/pharmacy may carry. for any flavor POM Wonderful Pomx tea! While Supplies Last so HURRY! MinuteClinic walk-in medical clinics are inside select CVS/pharmacy stores in 26 states and the District of Columbia. Visit us for treatment of common illness, vaccinations and wellness & prevention services. Open 7 days/week; no appointment necessary. Starting tomorrow, August 15, you can text DEALS to 727272 to get the Redbox daily deal. This will be going on for the next 10 days! Last time they did this, there were some good deals, so I can't wait to see what they're gonna offer this time! You may get offers like .50 off a rental, or even a dollar off a rental! And tomorrow (8/15) ONLY, you can get a FREE Redbox rental by using Foursquare to check in at Walgreens! You need to have/sign up for a Foursquare account here. Then you'll be given instructions on how to get your promo code for a FREE one-day DVD rental. Remember this is only good on 8/15 at Walgreens Redbox kiosks!